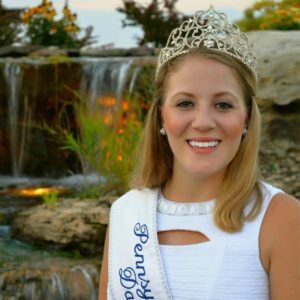 This month, we welcome Halee Wasson, the 2016-2017 Pennsylvania Dairy Princess as a guest contributor. Where I grew up is unlike many. I grew up hearing, seeing and smelling rural Pennsylvania. Every day, I can hear the cows mooing in the barnyard, see acres of corn growing over the never-ending hills and smell that pungent scent of manure for miles. To some, this might sound unappealing, but to me, it is the sight, sound and smell of many valuable life lessons. My youth has allowed me to the unique opportunity to become deeply rooted in agriculture. If you haven’t guessed yet, I grew up on a dairy farm. I consider myself fortunate. Growing up on a dairy farm has been one of my greatest blessings. Life’s lessons were not just talked about, they were taught by example to my five sisters and me. Every day of my youth, I watched my father and mother dedicate their days and nights to providing care for our cows, the environment and our local community. Beyond a love for animals and an appreciation for the dairy industry, I learned so much through their example. Here are three of the most important life lessons I learned growing up on my family’s dairy farm. Lesson #1: It takes dedication. Most professionals have days, weeks and even seasons off for ‘vacation’ from their careers. Imagine getting a call from your boss at 3:00 a.m. telling you to get to work right away. For dairy farmers, this is reality. Regardless of the day or time, cow care is the top priority, and a sick cow cannot wait until 9:00 a.m. In my home, we do not eat breakfast or dinner until the cows have been fed and milked. Everyone in my family knows and fully understands that the cows and farm come first. Dairy farming is not only a career, but it is a way of life practiced 24 hours a day, seven days a week, 365 days a year. Lesson #2: Find value in sharing your story. Growing up on a dairy farm, I have always believed there are certain things that cannot be taught or learned in the classroom, such as passion. For example, when you read and hear about organizations sharing misleading information about your livelihood, you begin to find passion within yourself to stand up for what you believe in. You find your purpose of sharing your family’s story of operating a farm because it is a positive, powerful and truthful. I am proud to represent my family’s heritage and way of life as the 2016-2017 Pennsylvania Dairy Princess. Lesson #3: Family is forever. Every day, my family and I wake up knowing that we are taking care of cows to provide a wholesome and nutritious food that will help grow our local community. This is easily achieved through the support we provide each other throughout each day and task. Being able to lean on my family in times of success and defeat is something I will never take for granted. We support one another in all aspects of our lives, especially when it comes to the family farm. The rural way of life may seem old-fashioned and even outdated to some, but this job, our livelihood, is very special to me. Although my family may face challenges, we have each other to get through it. Overall, I could not be more thankful to have been raised on a dairy farm and to have my roots in agriculture. The agriculture community and the people in it continue to teach me life lessons and have grown a passion in me for this unique profession. As I pursue a bachelors of science degree in agricultural and extension education at Pennsylvania State University, I am turning my roots, my heritage and my passion into my future. And, those farming life lessons will serve me well.